A great card, with a lovely fun image and the sentiment is super, we have a saying here, similar, As Snug as a Bug in a Rug. But I like yours better. Super cute Connie. Love the colors too. Connie, what a cute, cute image and a great card. I love it! Good luck with the house hunting. I'm so happy for you to get near your grandchildren and children. I swear that's one of the cutest little pigs I've ever seen!! Precious card, Connie! Have a good weekend and know you'll find something exactly right. I love, love, love this Connie, cute little pig and fabulous colour combination too. What a super cute card! I know what you mean about seeing an image and it's cute but once someone creates something spectacular, I HAVE to have it. Happens to me often. 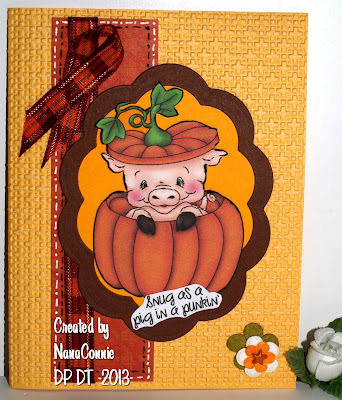 I love the embossed background, ribbon, faux stitching and the pretty fall colors! Too cute - love the colors you used! We’re so glad you decided to play along with us this week for the Catch The Bug BINGO Challenge with Bugaboo Stamps! Be sure to check out The Bug Blog Saturday for our newest challenge! We hope you’ll play along! Awe, he is so darn cute, so fun and fabulous coloring, lovin this super fun image. Have fun searching for the new digs. Adorable! And the colors really are fantastic...easy to see why you've used them more than once. I wanted to let you know I followed your advice and got myself some Promarkers. It will take me a while to get used to them but I'm happy I made the plunge! Thanks again for the hint. Super cute, and thanks for the reminder to link up before the 24th! I have a few hours, so I'm workingon it now! So cute - love the pig in the pumpkin - and hoping you find a house you like - I too miss my kids and grandkids who each live 500 miles from us. Ooooh this is fabulous, love your piggy and the fabulous colours in the background, delightful card! Hope your housing hunting is fruitful. Just passing by. 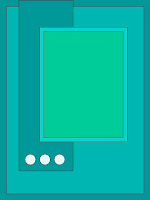 You see.....there are those fun textures going on again on your card. I have that embossing folder and just don't use it enough and yet I love love love it and of course I love that image. What a cute card! Love that little piggy. Great colouring NanaConnie.